See YouTube video - Pro Training workout #9. - reverse layups (back to the baseline) - inside foot, outside hand. 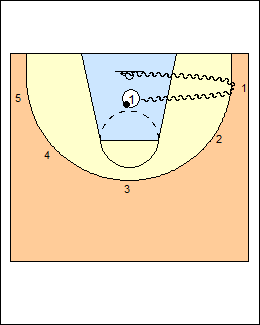 See Layups - Pro Training workout #8, Post play - Mikans. 10 makes each, both sides. 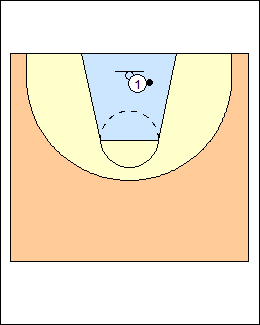 From the right block, step right-left, finish with a right-hand reverse layup (baseline hand), repeat for 10 makes. Progression - step left-right, finish with the left (inside) hand. Repeat from the left block for 40 total makes. 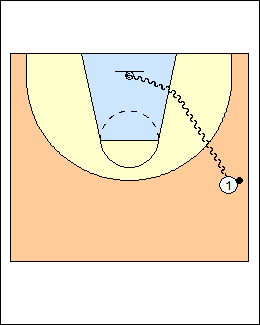 Start on the wing, shot fake, attack with the right hand (baseline), finish with a right-hand reverse layup, make 5. Progression - jab step right, attack middle, finish with a left-hand reverse layup. Repeat from the left wing for 20 total makes. See Dribbling - Pro Training workout #5 (Double moves to reverse layup). Start from the top of the key, jab step right then shot fake, attack with the right hand, finish with the inside (left) hand (off the outside foot), make 5. Progression - shot fake, jab step (right), crossover step and attack left, finish with the right hand. Repeat using the other pivot foot (right foot), i.e. - shot fake jab left, attack right (jab and cross). 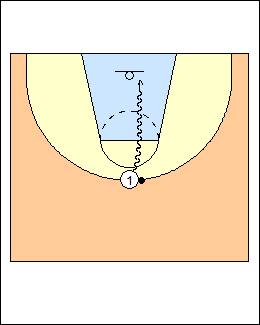 Start under the basket, dribble out to the right corner and back with the right hand, finish with a right-hand reverse layup (the left hand never touches the ball), on a make move clockwise, do the same thing at the right wing, top, left wing, left corner. See Layups - Pro Training workout #8, Shooting - 5-spot series, Dribbling - Pro Training workout #5 (3 forward, 1 back).